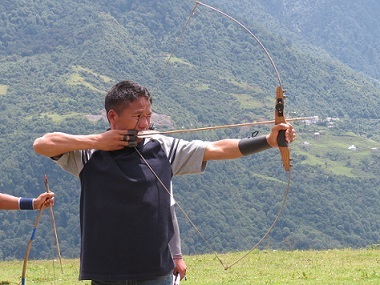 Two-day-long archery competition has been organised by the East Tawang Brigade of Blazing Sword Division at Lhou Gompa in Tawang district of Arunachal Pradesh concluded on Monday. The archery competition has been organised with an aim to increase awareness and foster friendship with sister forces and the civil administration. The event has seen an active participation from adjoining villages like Jungdha, Jung, Lhou Gompa and Tawang and personnel from the Seema Sashashtra Bal (SSB), Indo-Tibetan Border Police (ITBP) and Arunachal State Police personnel. In the event a total of 14 teams participated and the team from Urgling village emerged victorious. On the occasion, a medical camp was also organised by the Indian Army with the full support of local people. The medical camp was specially appreciated by the youth of the region as it motivated them and strengthened their resolve to join the Armed Forces.